Check out my remodel of my upstairs bathroom. It’s fresh, feminine, spa-like and I love it! I went all-in and overdid it a bit, but I’m so pleased with how it came out. Here are the before images. Pretty sad looking, huh? 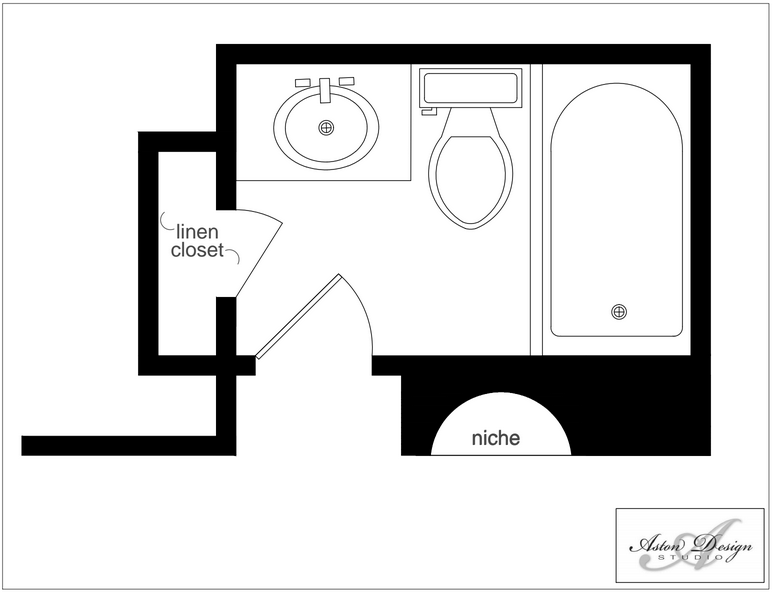 This tiny bathroom needed a bit more space. The attic was just behind the wall, so that’s where I expanded. I removed the tub and flipped the shower to the opposite wall and built it out there in the attic space. I captured some dead space in the wall for a built-in linen cabinet too. 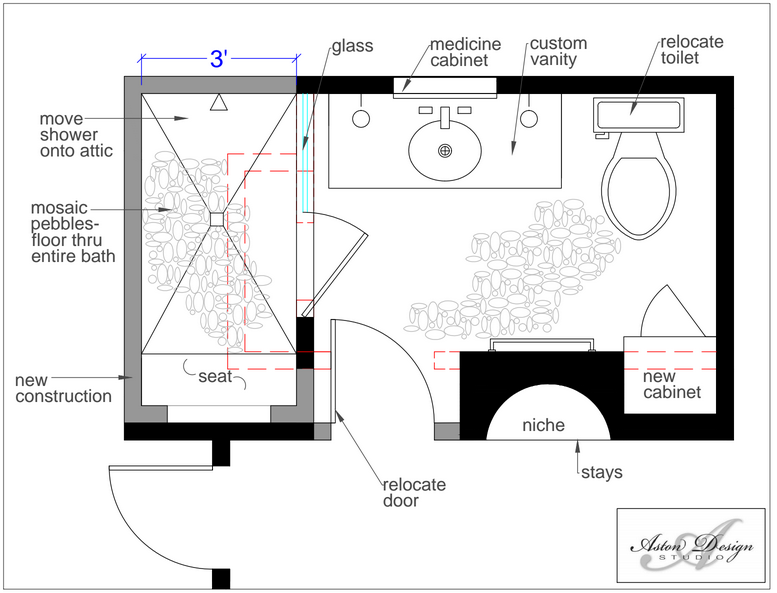 It made room for a wider, custom-vanity — designed by moi ;-) — and a much roomier bathroom! This was my daughter’s bathroom, so I just couldn’t help but go a little feminine with it in style. Think: Tiffany blue — aka: Benjamin Moore's "Spring Sky". I wanted a spa-like vibe too, so I set the tone with the sliced pebble floor, the large white subway, and the seagrass baskets. 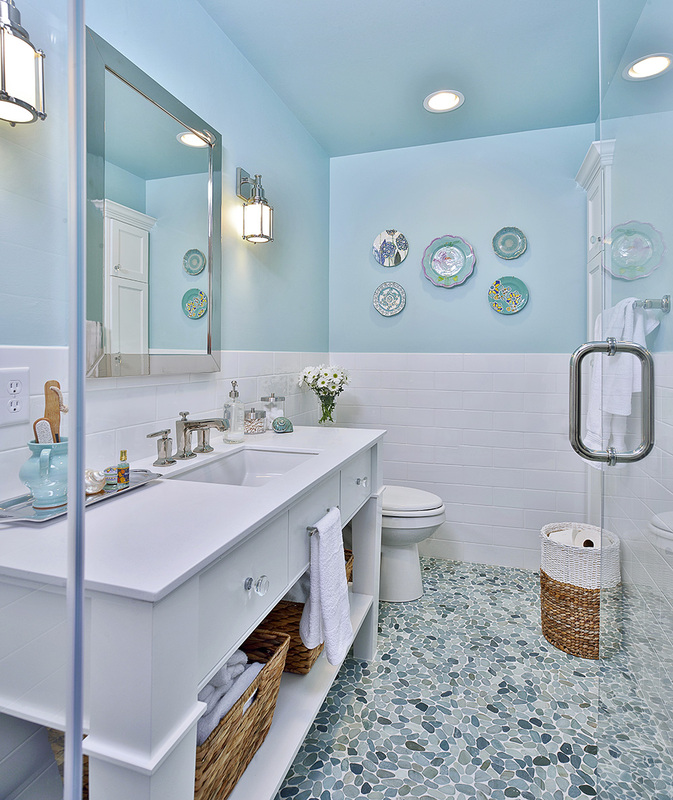 Those gleaming sconces and plumbing fixtures give the bathroom a little polish and sparkle. See how I painted the ceiling the color of the wall? In this small space I didn’t want to chop things up any more than I had to. Besides... That luscious color deserved to be there in a big dose. Finally, I finished this pretty little space off with a few plates on the wall. Because what girl doesn’t like a little Anthropologie in her bathroom?